Tranquility, great scenery, and bears!!! I spent ten days in Romania and it was no where near enough time. The first day I got there I was pretty tired and just stayed in my hotel until supper. I had supper with Razvan then went to bed early. The next day I went to the sanctuary and it was amazing. I went with one of the tour guys “Dan” and he gave me a very informative tour about each of the bears and the history of the sanctuary. I learned a lot about my favorite animal and also about their plight. I took lots of pictures and videos and was so happy being there breathing fresh air, being out in nature and watching the bears out in their own habitat. Over the weekend another volunteer came we went to Bran’s Castle. I also took a lot of pictures there and Razvan took us to a nice restaurant that had awesome food. Razvan was great to work with and also helped me change my accommodations during my stay. He made my short time in Romania very easy to adjust to. On the next Monday I started volunteering and I cut up salami for the bears. Forgot my gloves that day, but made sure I brought them the next day. The next two days we made bear ice cream and some of the smells were not so nice, but once I got into the groove it was fine. At the end of the week we went on one of the tours that was given by “Dan” I always learn more about the bears on tours and also took more photos. 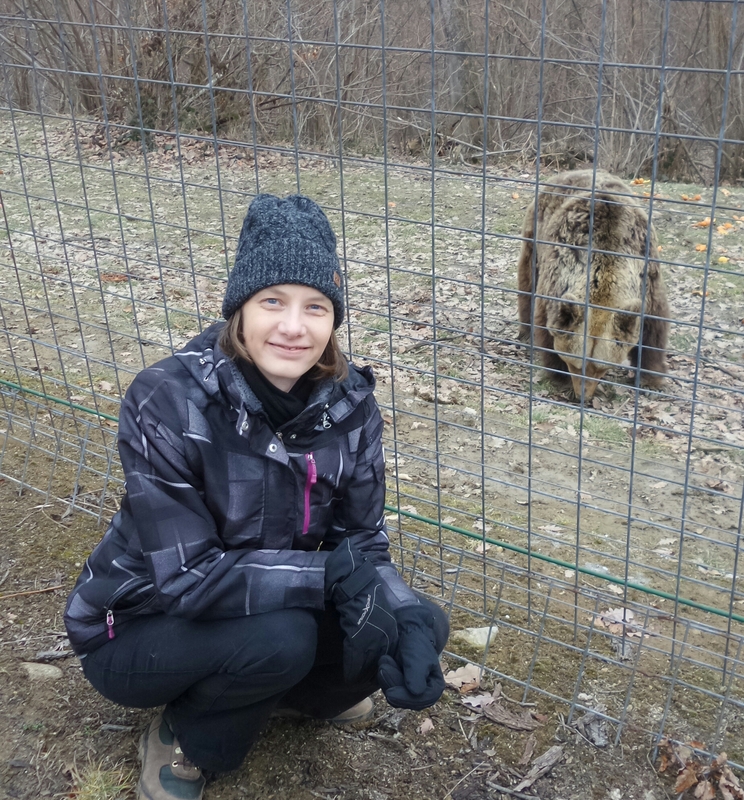 The last day I was at the sanctuary I got to meet “Christmas” the new bear that came to the sanctuary the day before. She is two years old and so adorable. She was to scared to come down, I know she will adjust shortly. That last day we also got to go around with the guys and feed the bears. That was amazing watching them eat and play. I got to watch one bear run with the truck because he knew food was coming. He was so funny to watch because he seemed so excited about the prospect of food!! I also watched bears rough housing and got to see how they interacted with the other bears. On my time off I walked around the square, shopped, ate, and also went ice skating. It was nice having time to explore the area and relax. My stay in Brasov was way to short, but rewarding. I got to learn about the bears I have loved since I was a kid. I also got to see first hand the damage that has been done at the hands of humans, which was hard to see and comprehend. I hope people become more educated about bears so they have better conditions to live in, in the future. I am glad I had the opportunity to volunteer there and I hope to come back again for a longer period of time. I met some great people and had a wonderful memorable time in Romania.